The photo of the lady says it too, so it is officially here. My photo did not do justice to the display. If you look closely, she has coils of springs for hair, multi-colored coils, I might add. Her sign says Spring is in the hair. She was hilarious and she made us laugh. 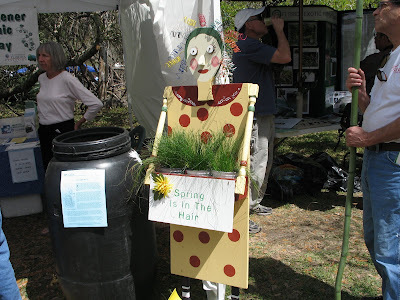 She was on display this week end at the Kanapaha Botanical Gardens located in Gainesville, Florida. 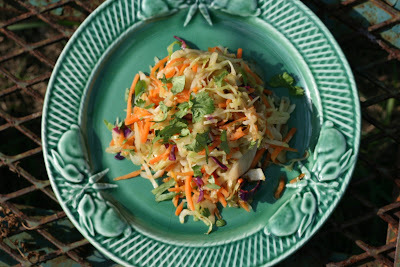 This slaw is easy, and is full of those great Indian Spices. The spices are warmed, then the slaw is sauteed. You can adjust the "heat" of the dish by upping the ante on the Jalapeno, if you are looking for a firey dish. This one can be served hot, at room temperature or cold. By the way, Gelskitchen is showcasing quickly prepared recipes this month, appropriately labled No Time To Cook. Check it out. 1. Toast the cumin seeds in a small dry skillet over high heat. like me, you'll have a coffee grinder that's easy to clean. 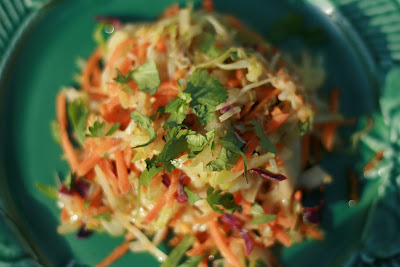 I love coleslaw and Indian spices! Together? Well, that sounds just great. And totally refreshing.